My pictorial approach draws its inspiration from floral subjects such as flower beds, or eventually a simple bunch of flowers and old stone flower-pots found in my natural gardens where summertime is busy with photographs and sketches. In this way, light and movement are captured and later on interpreted in my own artistic way. The painting is mostly defined as semi-figurative in its approach. 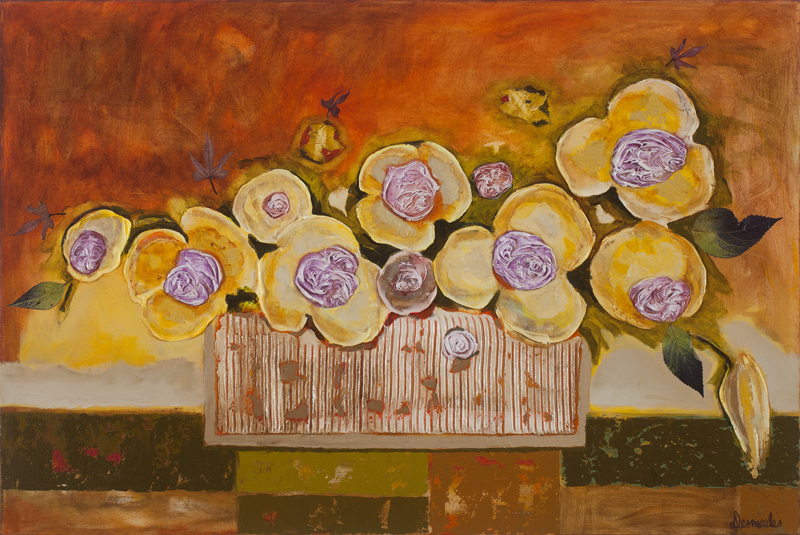 The stylized flowers are directly carved on the canvas with lively imagination, at times tinted with memories and motifs from my numerous travels around the globe. Acrylic is the preferred medium with an addition, from time to time, of paper collages, modeling paste and oil pastel to increase the texture of the final product. The spatula and modeling paste are used to accentuate movement and depth.